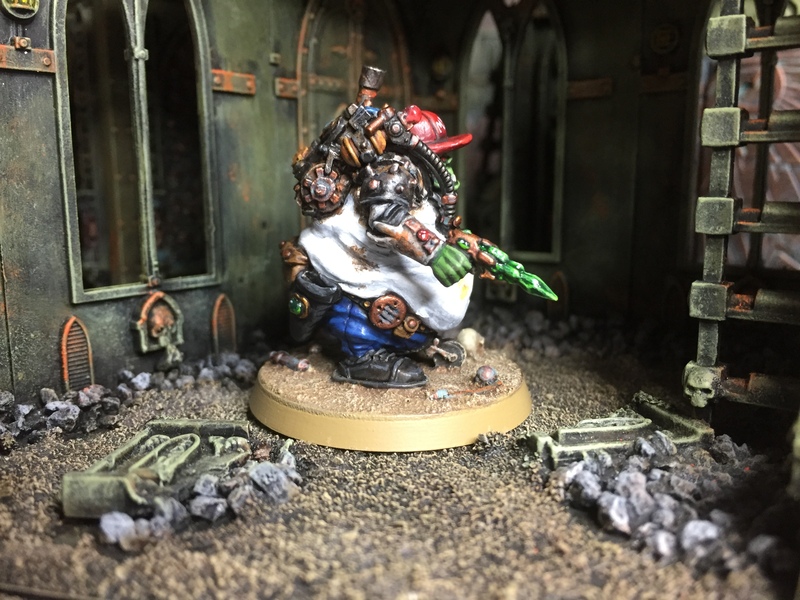 I used another classic ‘Ork-in-Power-Armour’ as the base model for Rulko, but removed the power glove & replaced it with a metal Painboy arm (donated from Doc Spleenripper!). I over-sculpted the arm to match it to the rest of his power Armour, and did the same with the Doc’s saw to make it into a Chainsword. Finally, I sculpted on a wee Bolt pistol, and converted his main gun to be a Flamer (including fuel tank on the back). It’s all quite subtle work, and I think Rulko really does look like a ‘proper’ figure from that period. 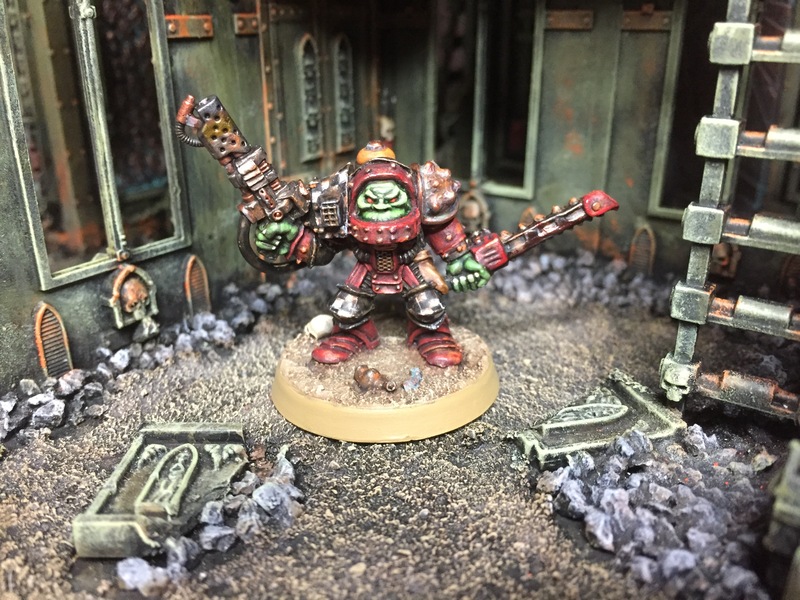 He doesn’t really look sneaky as per his character description, but really, how sneaky can an Ork in Power armour actually look? 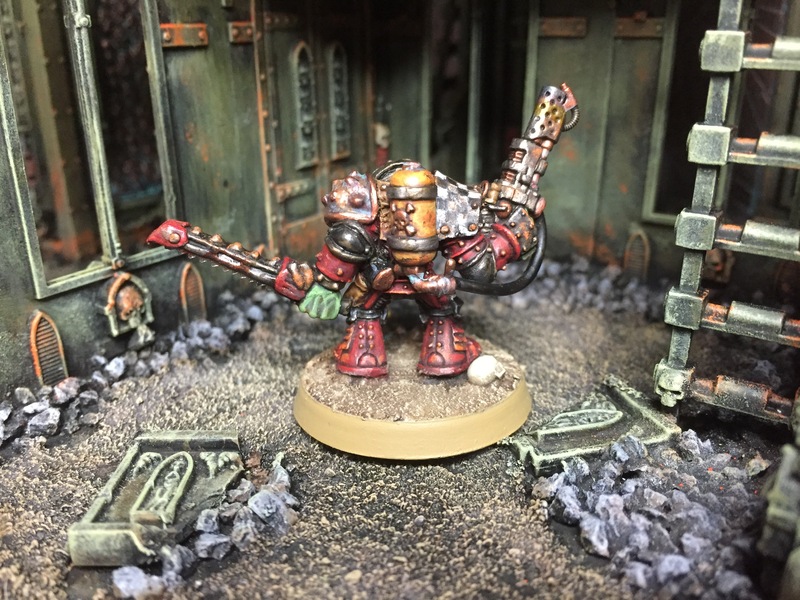 I painted him up predominantly red, and with less weathering & rust compared to the other PA Orks – I figured as Captain, his kit would be better maintained than the other guards. 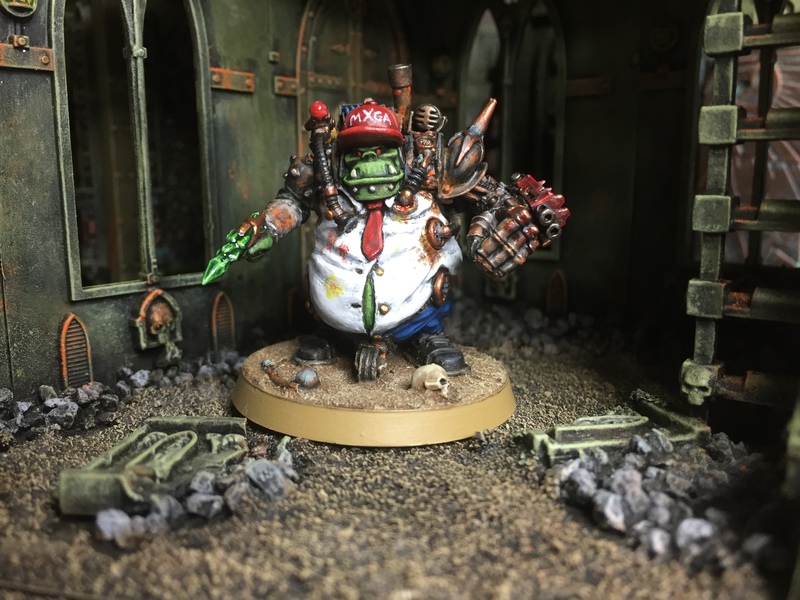 As you can probably guess, the current POTUS was the inspiration for this mini, and the opportunity to poke fun at the big man was too good to miss. Old RT used to be full of political commentary, (Ghazghkull Thraka famously being a mangling of Margret Thatcher for example), so really this is a nod back to those times. I hope none of my American followers are too offended – it’s just a bit of fun. 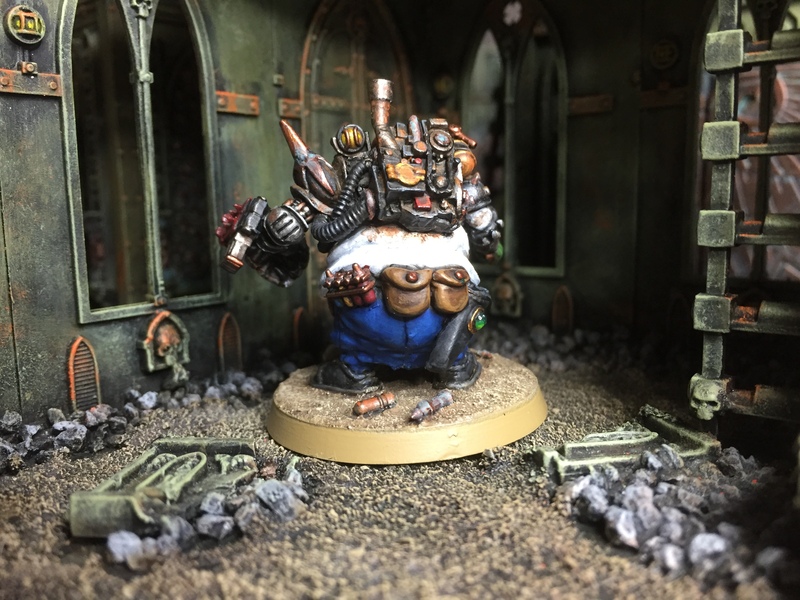 Appropriately for the head honcho, this was a very involved and complicated conversion… I started with an old Judge Dread Fatty, and added the shoulders & head from the Evil Sunz Nob from the ‘Ere we go range of Orks. His left arm comes from the mini I used for Rulko, and he has twin Bolt pistols mounted on the power glove (otherwise, how would he ever be able to use them!?). The right arm was donated from a damaged LE1 Space Orc that I picked up on the cheap – note the delightfully small hand ;-) I also changed the gun out for a new Neuro-disruptor from the Harlequin mini. Next, I added a backpack from an ‘Ere we go Mega Armoured Nob, and started adding cables and other gubbins to the mini. I wanted the backpack to look like some sort of primitive life support system for Kulo, as well as the generator for his Powerglove. Finally I sculpted on a few details – more suitably sized feet, collar & (power) tie, baseball hat, pouches, a holster & doodabs. Paint-wise, the armoured bits were a mix of grey and black, rust and gunk. I went with the classic power-dressing blue trousers, white shirt & red tie, and the ‘Make Xit Great Again’ hat finishes the look. The Neuro-disruptor was a faff to do – I’ve never painted a crystalline gun before, so it was a bit of an experiment… I hope it works! Now it’s time to start the Marines, so I’ll be in another building & prep phase for a while & I won’t be posting for at least a week. Next time I do post, it’ll be all about the Space Wolves. Haarooo!!! Fantastic – what a project this has been! Rulko is great and Kulo is just a fabulous pastiche. The only thing that’s missing is a group shot out of the box and set up on the table! I’m looking forward to seeing the Space Wolves – not a sentence I thought I’d ever write to be honest but after seeing all the care you’ve poured into the Orks I’m intrigued to see what you do with the old Space Vikings. Brilliant! I loved the Orks at every step and Kulo is a stunning conversion. Haha, you made me laugh with Kulo, I had never thought of that! 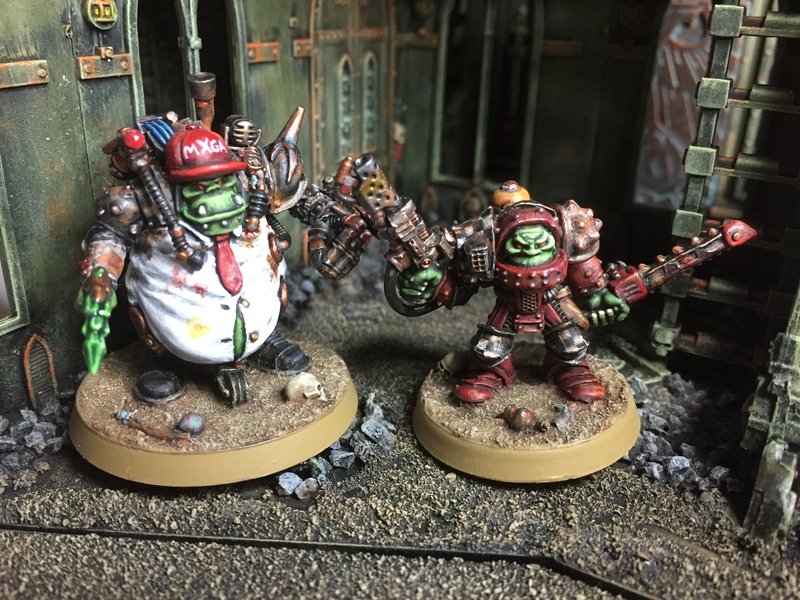 What an impressive collection of (so characterful and unique) Orks. Congratulations on the milestone!! Love the conversions- Rulko especially looks like a stock min- and i mean that as a compliment. Your take on Kulo is great- personally I was imagining an Ork version of Baron Harkonnen (especially the film version…). They are amazing! The sculpting you have done looks great, if you had said your first hero there in the red was a model from time period and you had just picked it up and painted I would of believed you. Absolutely smashing it as per usual mate. You already know it but I love your interpretation of Kulo! Excellent stuff! 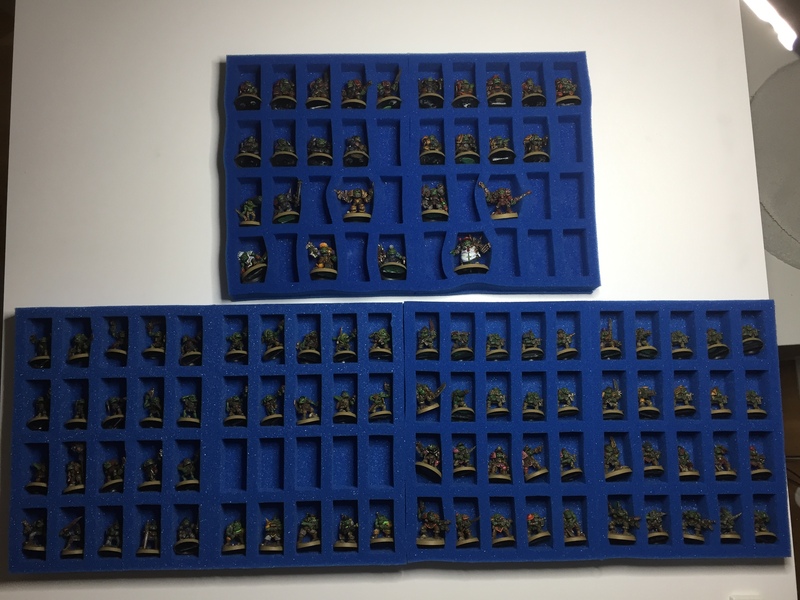 Very nice minis indeed! Had a good chortle at this, so well done all round! Hahah, brilliant! 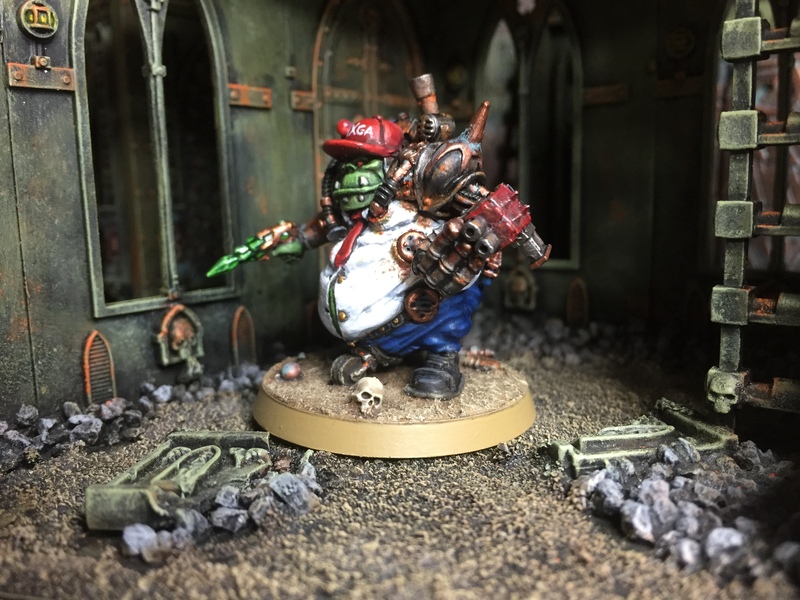 Thought I recognized a JD fatty in there, clever conversion work, Alex! Aww congrats on finishing the project man and what a finish. Both models are brilliant but Kulo is amazing. You’ve done so well with the entire project and with the amount of sculpting, converting and painting involved I’m very impressed by your determination to get it all done. Take a bow my friend. Nice work, though not offended, I am a big Trump guy! Nice work Alex! 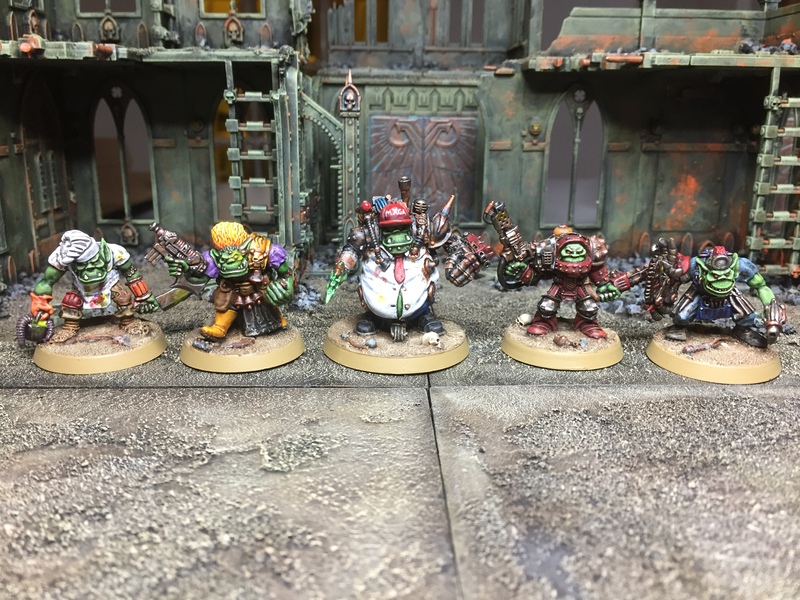 Really great mate but I reckon you need to get these little guys all out on the table for a proper group shot, no pressure!